The winners are Shahid Sheikh OBE, Gillian Loubser and Keith Chessell. The ‘Packaging Technology & Design’ document was written by WPO President, Professor Pierre Pienaar. 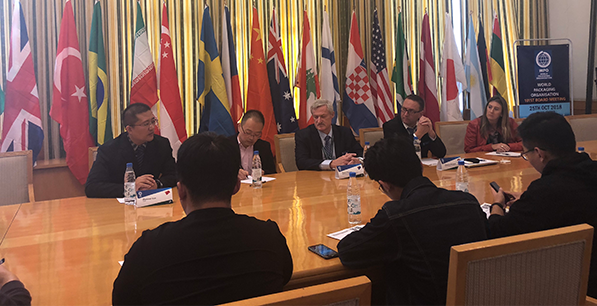 The judging process was part of the 2nd Board Meeting of WPO in 2018 and hosted by local member in China, CEPI. June 2018 From June 26 to 29, WPO (World Packaging Organization) will participate at Fispal Tecnologia 2018, the largest and most important processing, packaging and logistics show, for food and beverage industries, in Latin America. June 2018 WPO (World Packaging Organization) announces that the entries for WorldStar Packaging Awards are now open and the closing date is 20 September 2018. May 2018 Under the coordination of its Sustainability Committee, WPO (World Packaging Organisation) is releasing a Position Paper about Packaging in Circular Economy. May 2018 As part of its Education strategy, WPO (World Packaging Organisation – www.worldpackaging.org), is able to offer 3 to 5 days long Packaging Technology Training Courses amongst its members´ organisations. May, 2018 Over 500 people attended the WorldStar Awards Presentations & Gala Dinner, the most important global packaging competition in the world, organized by WPO (World Packaging Organization – www.worldpackaging.org). April 2018 From April 29 to May 4, 33 WPO members, representing 20 countries, will join on the Gold Coast, Australia, to participate in the 100th WPO Board Meeting, scheduled to May 1st. On April 30, WPO Working Groups – Education, Marketing and Sustainability – will join to discuss the ongoing projects and propose new actions in the subsequent Board Meeting. April 2018 Due to the prestige of the WorldStar Awards, the unique and exclusive global packaging competition organized by WPO (World Packaging Organisation – www.worldpackaging.org), PMMI (The Association for Packaging and Processing Technologies), organizer and producer of the PACK EXPO portfolio of trade shows, has renewed its sponsorship of the WorldStar Awards Ceremony for the next two years (2018 and 2019). This year the gala ceremony and dinner will take place on May 2nd, on Gold Coast, Australia. From February to April this year, it will be three events,two in India and one in Mexico. The Executive Board is formed by professionals from 9 different countries, reinforcing the global approach of the World Packaging Organization. 100 of the 194 winners of the 2016 WorldStar Packaging Awards, the most important and global packaging competition in the world, organized by WPO (World Packaging Organization. The judging session took place over 2 days in October, 2015 as part of the 95th WPO Board Meeting activities. 17 late entries were judged on line by the same panel of judges during November. Representatives from 19 packaging associations, members of WPO (World Packaging Organisation), judged 293 packaging projects, from 35 countries that entered the WorldStar Awards 2016. The judging sessions took place on 8th and 10th October during WPO’s Board Meeting program, held in Mumbai, India. 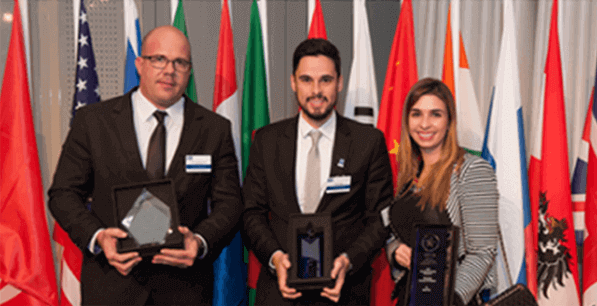 WPO (World Packaging Organization) has just announced the list of candidates for three special awards within the WorldStar Awards 2016 programme. WPO (World Packaging Organization) announced that the entries for WorldStar Packaging Awards 2014 are open and will close on September 27, 2013. Considered the most important global packaging award, the WorldStar is based on the judges’ consensus that a pack is superior in its own right and better in its class, in execution, or innovation by comparison. The judges consider the following criteria: protection and preservation of contents; ease of handling, filling, opening and closing; adequacy of information; sales appeal; graphic design; quality of production; economy of material and cost reduction; environment; ingenuity of construction; and adaption to local conditions (production, materials, market etc). Judging has just finished for the WorldStar Awards 2013, the most important packaging awards competition in the world, organised by WPO (World Packaging Organisation). Once more the process identified the best-of-the-best in the world of packaging. 25 judges from all over the world comprised the jury and they came together as part of the World Packaging Organization’s series of meetings in Singapore between 24 and 27 November. The second Board Meeting of 2013 of WPO (World Packaging Organization) will take place in Barcelona, Spain, and will be hosted by the local member, Graphispack. Besides the various committee meetings and the Board Meeting, the representatives of packaging associations, from 22 countries, will also select WorldStar Awards 2014, to be awarded during Interpack, in Düsseldorf, next May. In total, 249 packaging will participate in the competition this year, in 08 categories, representing 35 countries. Voting session is scheduled for November 7. The ceremony to announce the winners of the WorldStar Awards 2013 was held on May 9th, during Auspack, in Sydney (Australia). The 2013 round of the WorldStars, the most important packaging award in the world, organized by WPO (World Packaging Organization), brought in 316 entries from 32 countries from around the world. More than 227 people attended the awards ceremony. From May 06 to 10, WPO (World Packaging Organization) Board and members will be in Sydney, Australia, to accomplish its first meeting of the year. The week of work is organized by AIP (Australian Institute of Packaging), a very active WPO member, and will be part of the program of Auspack Plus 2013, the major packaging show in the region. WPO (World Packaging Organization) has just announced the list of candidates for three special awards within the WorldStar Awards 2013. Delegates from all over the world gathered in the UK for World Packaging Organization meetings and WorldStar Judging. Stockholm (Sweden), November 2011 WorldStar Student 2011 - International Packaging Design Competition organized by WPO (World Packaging Organization), attracted 156 entries from 15 countries around the world. Out of these, 152 were selected as WorldStar Student 2011 winners by the jury, including 4 WorldStar Student winners, 10 Certificate of Merit winners and 138 Certificate of Recognition winners. WPO supports packaging training program in India. The second edition of the Program joins 14 participants from six different countries, all WPO members. WorldStar 2010 brings in 135 winners! The 2010 edition of WorldStar, the most important packaging award in the world, organized by WPO (World Packaging Organization), brought in 278 entries from 30 countries from around the world - 47 from India, 37 from Japan, 33 from Turkey, 29 from China, 18 from Mexico, 12 from the USA, 10 from France, 10 from Germany, 9 from Hungary, 9 from Spain, 7 from the Czech Republic, 7 from Switzerland, 6 from Singapore, 5 from Brazil, 5 from Russia, 4 from Ukraine, 4 from Poland, 4 from Israel, 4 from Slovakia, 3 from the UK, 3 from the Netherlands, 2 from Austria, 2 from Norway, 2 from Thailand; Belgium, Colombia, Denmark, Finland, Latvia and Sri Lanka had one entry each. With the presence of 35 representatives of packaging associations around the world, from 20 countries, the World Packaging Organization (WPO) accomplished its second and last meeting of 2010 in Istanbul, Turkey, from September 13 to 17, hosted by ASD – the Turkish Packaging Manufacturers Association. The WorldStar Awards Ceremony, held at Beijing International Convention Centre, on Tuesday 1 June was hosted by the China Packaging Federation and 14 countries were in attendance to receive their awards. In its first Board meeting of 2010, scheduled to May 31st, in Beijing, China, Keith Pearson, President of WPO (World Packaging Organisation), will sign two important contracts for the development of the entity’s activities. The first one, with the British The Packaging Society, WPO member and part of IOM3 (The Institute of Materials, Minerals and Mining), is related to the administration and clerical work of the WorldStar competition. According to the agreement, IOM3 will be responsible for all procedures involved in the competition like receiving entries and organizing the ceremony and the trophies. With the participation of 18 country representatives – Bangladesh, Brazil, China (2), Ghana, India, Japan, Nigeria, South Africa, Spain, Sri Lanka, Sweden, Thailand, Tunisia, Turkey (2), UK and US – WPO (World Packaging Organisation) accomplished its second Board Meeting of 2009 in Colombo, capital of Sri Lanka, from November 17 to 20. The meeting, hosted by Sri Lanka Institute of Packaging and Packaging Development Centre, had the main purpose of defining new strategies and projects for 2010, as well as reviewing the results of 2009 plans and actions. WorldStar winners selected in Sri Lanka! WorldStar 2009 attracted 237 entries from 35 countries around the world. Out of these, 129 were selected as WorldStar winners 2009 by the jury in their meeting in Mount Lavinia, a district of Colombo, Sri Lanka, on November 17, 2009. Five winners were also nominated for the “best-of-the best” President’s Award. The jury consisted of 14 country representatives from the World Packaging Organisation (WPO) and one representative from the International Packaging Press Organisation (IPPO).